Why is honey so valuable? What are polyphenols and what are they good for? Honey contains lots of healthy compounds, polyphenols included, highly beneficial to our bodies. We’ve heard this a lot: honey is good, it has antioxidants, vitamins, enzymes… “It’s a natural antibiotic” – all honey sellers will tell you that, even if they don’t even know what these are. In the end, we don’t really need to know what’s inside honey (in fact scientists haven’t even discovered yet all its compounds ) as long as it does its job, right? Do we need to know how our body works, for it to work properly? No, we don’t. It is true that sometimes we need to fix some of its irregularities, when they happen, and for this it is a good thing to know how a body works so that we know what needs to be fixed. Which is the main reason we are interested in the composition of honey, to know when and for what to use it. Sugars, enzymes, vitamins, minerals, water, antioxidants (even pinocembrin, an antioxidant associated with improved brain functioning), free aminoacids, peptides, trace compounds, carotenoid derivatives and others. Its composition depends a lot on the type of honey. Honeydew honey has a different composition than floral honeys, and floral honeys are different according to the type of flower used. 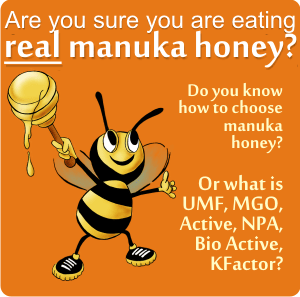 And then there is manula honey, which differentiates itself due to a higher content of methylglyoxal (MGO) and DHA (the substance found in the manuka flower’s nectar which will turn into MGO in honey, in time). Polyphenols are substances found in fruits, vegetables, tea, olive oil etc. They are one of the most important groups of compounds occurring in plants, in which they are widely distributed. (Also products of the secondary metabolism of plants). They are associated with many heath benefits, hence the great interest lately shown in them. Polyphenols contain flavonoids and phenolic acids. In honey, polyphenols are an important group of compounds with respect to appearance and functional properties, also used to determine the floral source of a honey. 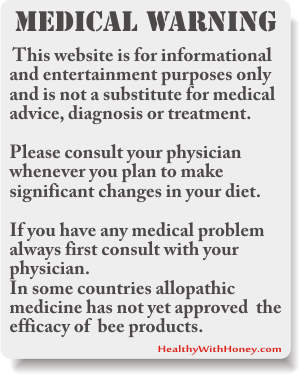 – Quercetin for sunﬂower honey. – Hydroxycinnamates (caffeic, p-coumaric and ferulic acids) in chestnut honey. 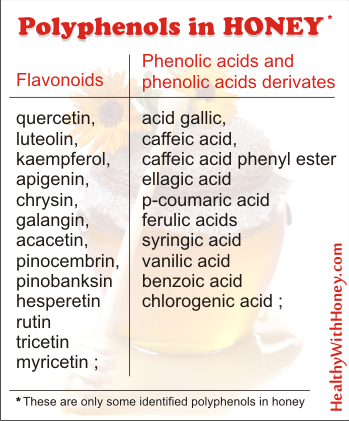 Polyphenols are not the same in all honeys. While some of them are common to all types of honey, some are specific to certain monofloral honeys. • flavonoids: E.g. : quercetin, luteolin, kaempferol, apigenin, chrysin, galangin, acacetin, pinocembrin, pinobanksin and others. • phenolic acids and phenolic acids derivates: E.g. : acid gallic, caffeic acid, caffeic acid phenyl ester (CAPE) and others. How much polyphenol content is there in honey? Depending on the honey type, total polyphenols can be found in smaller or bigger quantities, from 56 mg/kg to 500 mg/kg. As a rule, the darker the honey, the higher the polyphenol content, the bigger the antioxidant properties. The content of polyphenolic compounds (ﬂavonoids and phenolic acids) in honey is strongly influenced by the ﬂoral and geographical origin as well as by climate characteristic of the site. Altitude is also an important factor. For example Nepalese honeys have been tested for their antioxidant compounds and total phenolic content. Total phenolic content ranged from 154.87 to 41.90 mg gallic acid equivalent (GAE/100 g) showing that the Nepalese honey collected from high altitude region contained more antioxidants than honey of low altitude region. 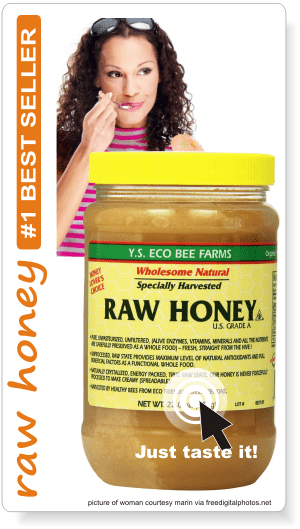 • The polyphenols are responsible for the antioxidant properties of honey. – prevention of the peroxidation process by reducing alkoxyl and peroxyl radicals. Benavente-García et al. showed in 1997 that flavonoids are potent radical scavengers and, thus able to reduce many aging and degenerative events including reactive oxygen species. Schramm et al. showed in 2003 in the study Honey with high levels of antioxidants can provide protection to healthy human subjects that phenolic antioxidants from processed buckwheat honey are bioavailable, and that they increase antioxidant activity of plasma. It was thus speculated that these compounds may augment defenses against oxidative stress and that they might be able to protect humans from oxidative stress. – preventing low-density lipoproteins (LDLs) from oxidizing. Some of the polyphenols like quercetin, acacetin, caffeic acid phenethyl ester (CAPE), kaempferol, and galangin present in honey have been reported as promising pharmaceutical drugs in the treatment of cardiovascular diseases. Many of the pharmacological properties of flavonoids can be linked to the abilities of these compounds to inhibit enzymes involved in cell activation. In vitro experiments demonstrated the capacity of flavonoids to modify the activity of enzymatic systems in mammals (kinases, phospholipases, ATPase, lipooxygenases, cyclooxygenases, phosphodiesterases etc.). Middleton et al., said in 2000 that many epidemiological studies have shown that regular flavonoid intake is associated with a reduced risk of cardiovascular diseases. Jendekova et al., showed in a 2006 study that in the coronary heart disease, the protective effects of flavonoids include mainly antithrombotic, antiischemic, anti-oxidant, and vasorelaxant. Polyphenols are considered to be promising agents in the treatment of cancer according to the research reported by Jaganathan and Mandal in 2009.
compounds in tested honey samples. Antibacterial activity was tested against Escherichia coli and Paenibacillus larvae, the first a model organism for bacteria and other a pathogenic bacterium causing American foul brood disease in Apis mellifera. Heather and honeydew honey had the highest content of total polyphenols (127.35 and 123.28 mgGAE/100 g and), while sunflower honey together with honeydew honey show the highest content of total flavonoids (64.25 and 65.98 mgQE/100 g honey). whereas multifloral honey showed highest activity against E.coli. Yet, polyphenol bioavailability is dependent upon many variables including gut absorption, glucuronide excretion to the intestinal lumen, microbiota metabolism, liver and gut metabolism, plasma kinetics, a variety of metabolites in the bloodstream, bonding to albumin, cell assimilation and metabolism, accumulation in tissues and bile, and urinary excretion. 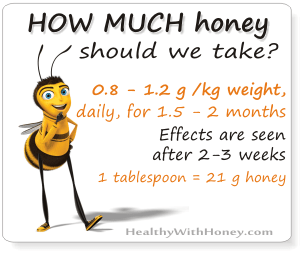 Do we need our honey to be raw to still have the polyphenols in it? Heat and time alter the phenolic content…. • In his study “Honey Proteins and their Interaction with Polyphenols”, published in 2010, MSc thesis, Brock University St. Catharines, Ontario and Alvarez L M showed that the reduction of proteins during honey storage was caused, partially, by the protein complexation with phenolics. Honey melanoidins are multi-component polymers consisting of protein–polyphenol–oligosaccharide complexes. On another hand, a direct interaction between polyphenols and melanoidins resulted in a loss or gain of function for melanoidin antioxidant activity. Depending on the initial concentration of melanoidins in unheated honeys, heat treatment either caused an accelerated formation of high molecular weight melanoidins and an increase in the radical scavenging activity (light and medium honeys) or the degradation of melanoidins and the reduction in radical scavenging activity (dark honeys). Thess studies led to a view of honey melanoidins as high molecular weight multi-component macromolecules possessing antioxidant activity (see the studies of Katrina Brudzynski in March 2011 and August 2011). We can use honey for everything. 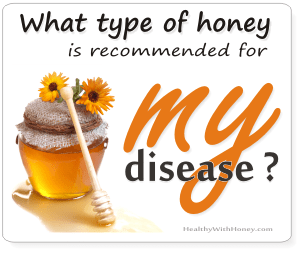 In fact, it is recommended to use only honey for our daily need of sugars. Which is indeed a very difficult task, as sugar is inserted in everything in our markets, from milk to meat. But we can replace the sugar in our home made cakes, in our coffee, teas, use it instead of jam and in so many other ways. And yes, we can use it in our cooking as well. Of course it is recommended to be eaten raw, which means unheated, but it doesn’t matter if besides raw honey we also eat heated honey in our cooking. Some say that when honey is heated it becomes poisoned. Not true. A certain substance from it, methylglyoxal (which, alone, is indeed toxic) will probably double its quantity, but this is still insignificant compared to the quantity of MGO found in manuka honey. Some others say it will lose its vitamins and enzymes. It’s true, everything changes. But some enzymes will increase, while others will decrease. Here are some things that happen in the process of heating: What is the difference between pure honey and raw honey? My point here is that honey is the perfect sweetener, which can be also be used heated – we will not be poisoning ourselves. And of course, we should also eat it raw, because its power relies not only on its initial composition but also on the synergy of its elements. Honey work just like the whole hive works. Taken apart, none of the bees will be able to produce honey. Together they can do it. It’s the same with honey: the enzymes alone, the antioxidants alone are useless. But combined in specific amounts they do miracles. ¹ TOMÁS-BARBERÁN, F A; MARTOS, I; FERRERES, F; RADOVIC, B S; ANKLAM, E (2001) HPLC flavonoid profiles as markers for the botanical origin of European unifloral honeys. Journal of the Science of Food and Agriculture 81 (5): 485-496.
hoenys produced in Croatia. Food Chemistry: in press. Honey is a natural remedy for conjunctivitis. And other eye diseases. Eat honey! It’s good for your heart problem!